Part of Series: Judoon Justice belongs to a series called A Timelord and his Madman, which actually starts with "His Silent Mind", and can be considered as a sequel, but can also be read as a stand-alone. For those who want to read it as a stand-alone, read the short summary for "His Silent Mind". For those who want to catch up with the first story, go Here. Characters: The 10th Doctor, The Master (John Simm), Wilfred Mott, Donna Noble, The Schaduw Architect. The 10th Doctor didn't sacrifice himself to save Wilf, because he wasn't there in the final scene to lock himself in the radiation-booth. Some poor, innocent, but highly dispensable white-coat got roasted by the 100 megatons of radiation instead. The Master disappeared with the Timelords, seemingly lost with the others as Gallifrey fell in the final days of the Time war. After sending Wilf home with his family, the Doctor starts to wander alone in the universe, trying to find the Master using the remains of the white point star as a guidance. His quest brings him to a hostile planet that balances on the verge of a blackhole. 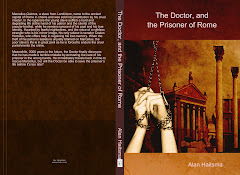 There he finds the Master in a dark tower where has been imprisoned for the last 2000 years. He has survived the destruction of Gallifrey by the mercy of the Doctor's guarding angel, but has lost his mind after Rassilon cut out the drums from him for retaliation. For the first time since he was a child and had stared in the untempered schism, the Master had experienced something what could be cognized as guilt, and the remorse he had felt for his crimes combined with the solitude he was forced to endure had actually driven him insane. When the Doctor tries to convince him to leave, the Master refuses, knowing that he cannot escape the doomed planet without triggering its destruction and taking the Doctor with him. The Master tricks the Doctor in leaving the planet with his human companions, but the Doctor manages to pull a last minute rescue to free the Master from the tower before the planet is swallowed by the blackhole and is destroyed. However, the Master’s mind has suffered greatly and has deteriorated into a recessive, unconscious state. The Doctor, determined to save his childhood friend, decides to leave the Tardis suspended in time, while he enters the Master’s mind in an effort to bring him back. Just when the Doctor succeeds to let the Master recover to some form of consciousness, the Tardis is discovered by the fleet of the Shadow Proclamation. 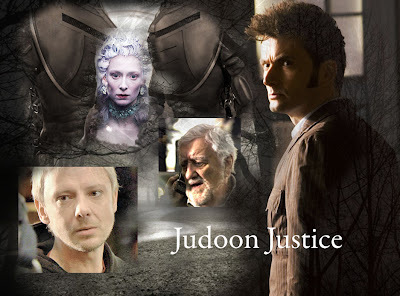 The Master is taken from board, and the Doctor faces the forces of the Lady Shadow Architect and her followers as they are keen on bringing the Master to Judoon Justice. To go to chapter 1, follow me HERE. Nest chapter will be posted next saturday, the 13th of march 2010.